Sparrow In Flight: What Am I Working On? I have been working on a mini-version of Grand Illusion Mystery by Bonnie Hunter. When I say mini, I really do mean mini! I took the measurements she gave subtracted 1/2" then divided the number in half and then added back in the 1/2" for the seams. There is a part of me that wanted to stop the process completely BUT once I calmed down the design has grown on me and I am not freaking out too much at my color choices. 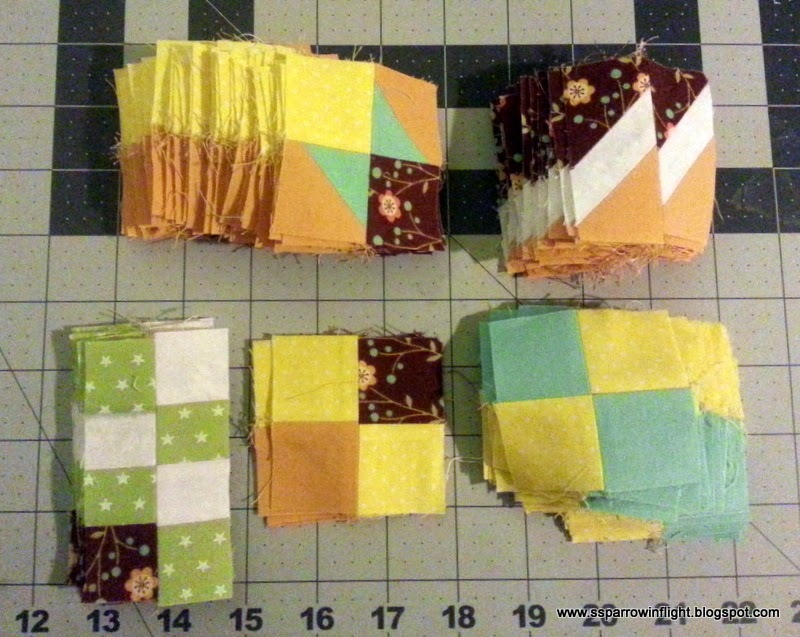 I should admit to you that my original intention had not been to do a reduced sized Quilt, but to make a reduced AMOUNT of blocks. So I will confess when I was in the process of making the gazillion HST's I simply made the wrong size so I cut them down to mini-version. AND trust me, it doesn't take less work just because the block sizes are smaller. I need to go check the mail box this afternoon because I ran out of my two solids and I am waiting to get my box! In the meantime, I plan to throw a couple of blocks together with the parts I have here. If I am able to I will try to post an update tonight!! I can't wait to see it because you color scheme is so different from mine. I also LOVE that you did it in a mini virsion. Mini is ALWAYS cuter! I'll be checking back to see how this all turns out. I cannot wait to see it! I agree those minis take just as long! That should look great. What a great idea it is to do a mini version.